↑ Ellis, M., van Weenen, J., Copley, P., Dickman, C., Mawson, P. & Woinarski, J. (2008). Macropus rufus. 2008 संकटग्रस्त प्रजातियों की IUCN लाल सूची. IUCN 2008. Retrieved on 28 December 2008. 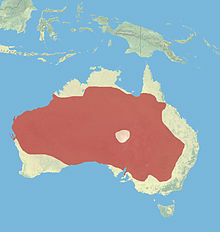 ↑ "Red Kangaroo Fact Sheet". library.sandiegozoo.org. Retrieved 2015-10-04.